"We purchased the poster, and we have absolutely loved getting the signatures of all the people who have cared for our daughter. 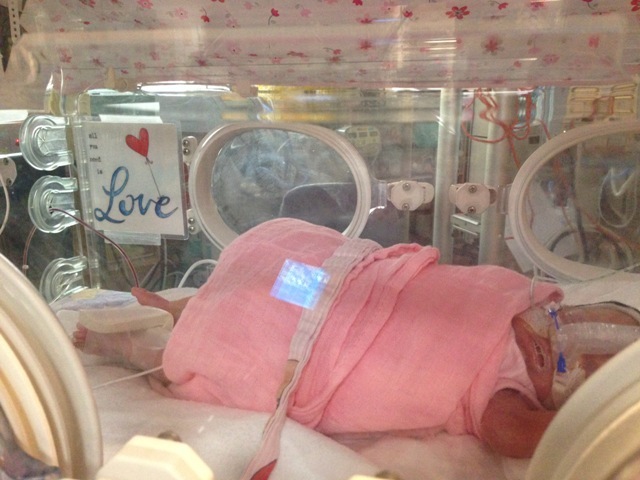 We very quickly ran out of room as we have been on 3 different units in the hospital (NICU, PICU, Ned/Surg). The other night my husband and I were searching through the signatures and picking out our favorite nurses and doctors. I can't wait to show her all the people who had a hand in taking care of her and even saving her life on a couple of occasions." "We watched our girl lay in her crib lifeless for approximately 5 days, and I can't tell you how much it scared the hell out of us. During this time I thought we were going to lose her, but my partner had a stronger belief it was all going to be ok. It was the hardest time because emotionally I just couldn't give any more, I had nothing left in the tank and not being able to help my child killed me. It was during this time that your crib art became such an integral factor in my belief system when I had nothing. I'd sit look at my girl and repeatedly read the crib art out loud, to her but also to reassure myself as well. Every day throughout our journey I would always make sure her crib art quotes were strategically positioned for my viewing. It gave me a sense of having control and connecting to our personalized space while in a sterile environment. I thought if i can't dress my little girl in clothes then the next best thing was decorate her crib." "I am a grandparent to NICU baby, and I bought a signature poster & art cards for my grandson. My daughter thought it was the best idea, and even better, the nurses really loved it! I look forward to telling my sweet grandson (who is now a healthy 6 month old, by the way!) all about the wonderful nurses and doctors who took care of him, and showing him their names on the adorable poster. I'm so glad I found your website, because I didn't really know what would make an appropriate gift during this scary time, and the poster & cards were just perfect. Thank you!"